Apsrtc Recruitment 2016| Andhra Pradesh State Road Transport Corporation against APSRTC Recruitment 2016. Here is good news for all those aspirants who have a good skill in driving and wanted to work as a government employee. Recently a recruitment notice has been published by Andhra Pradesh State Road Transport Corporation against APSRTC Recruitment 2016. 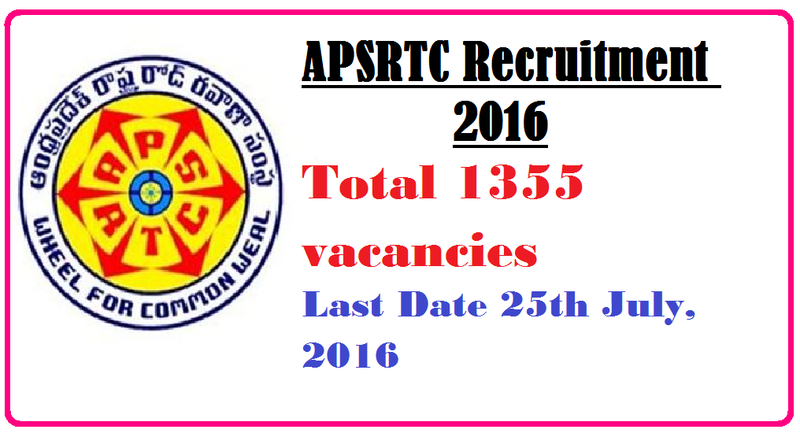 Applicants can apply for 1355 Driver positions that are offered against APSRTC Recruitment 2016 on contract basis for SC/ST category applicants of Andhra Pradesh.. Application form of interested candidates will be submitted via offline mode on or before 25th July, 2016. More relevant information is mentioned below such as age limit, education qualification, pay band, selection mode, etc. Name of the vacant post: Driver is the post that is vacant for applying by the interested candidates against APSRTC Recruitment 2016. Age Block: Applicants age limit must not be less than 22 years and not even more than 45 years as on 01-07-2016. Method of Enrollment: Driving test will be the method of enrollment for applying candidates. Remuneration: After selection candidates will be getting Rs.13700/- every month as their remuneration. Way of Applying: Applicants application form must be dully filled by them and must be forwarded along with attachment of all relevant credentials to the respective Depot Manager/Regional Office before 25th July, 2016.